I love this watch! Keeps pretty good time and looks awesome! Not to big and not too small! This Seiko men's 'Seiko 5' black weave fabric watch features a black dial. With luminous indices and white Arabic numerals, this watch includes Japanese automatic movement and secures with a tang buckle clasp. Awesome looking watch, only the face of the watch is smaller than usual and the band is narrow. It appeared to be a female's watch. I replaced the band with one that is wider than the original and it looks ok, now. 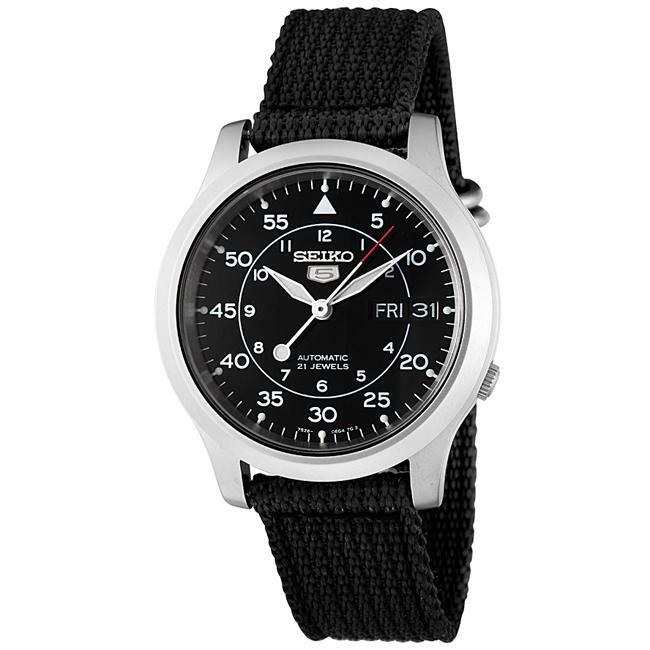 Aside from that, the quality is all Seiko which is quite good. Wearing it every day and enjoying it! Band is a good fit. Self-winding feature is handy. No negatives at all. Upon opening up the box I realized that the band was rather small not a criticism just something to point out to those of you who are unaware; also the watch is pretty small so read the description carefully before purchasing.Though most of the reviews I have read elsewhere were satisfactory, I believe your money should be spent elsewhere on a much more reliable watch.I found that after I set the watch to the correct time setting the following day It started to lose time, and the dates sown on the dial were inaccurate. I reset it again the following day and the same result occurred. This should not have happened with a new product in general, especially one that is nearly *** If you still want to buy it, then get the protection plan that comes with it, at least in my opinion ill be sending mine back first chance I get. what u see is what you get. this product is really satisfying.